A big, talented forward who plays with all out hustle, teamwork and sportsmanship. 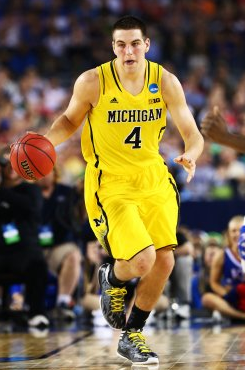 Built like a bull, McGary puts in work in the paint on both the offensive and defensive ends of the court. A very intelligent and passionate player who has a lot of intangibles. Has good mobility for a big guy and is very quick with his moves to the basket. Plays with good suddenness. Is mostly a back to the basket scorer who commands the double team in the low post. Has a great handle for a big power forward and can bring the ball up the court if needed and has a little bit of playmaking ability. A very talented passer. Decent shot blocker and help defender who is always willing to battle down on the block. Not the quickest runner and might have trouble keeping up with NBA power forwards. Can be beat on the dribble drive and is better suited for playing in the paint. Needs to get into top shape to reach his potential. Is not a rim protector at the NBA level.